The study investigated the nutritional, sensory and storage qualities of substituted mungbeangarri diets. Mungbean substituted garri in different proportions (30%, 40%, 50%, and 60%) to generate ready-to-eat mungbean-garri diets. Substituted mungbean-garri samples and 100% garri were subjected to chemical (proximate, anti-nutrient) and sensory analysis, the most acceptable diet was further subjected to microbial growth count. The proximate composition of the garri samples range from 2.16 g-4.42 g/100 (protein), 1.68 g-2.04 g/100 (crude fiber) and 375 kcl-388 kcal (energy). Anti-nutrient composition of 1.4% (saponin), 0.19% (phytate) and 0.43% (oxalate) were found to be significantly lower (p<0.05) in sample A (30%M:70%G). The sensory analysis was conducted with 30 taste panels (school children) on a nine-point hedonic scale. Sample A (30%M:70%G) ranked highest in all the parameters (appearance, texture, mouldability and general acceptability) tasted even higher than the values obtained for 100% garri sample, though not significant (p<0.05). Sample A (30%M:70%G) was later stored in three different packaging materials (polythene bag, sac bag and plastic container) on shelf and inside the cupboard for a period of four weeks. Lower microbial growth count of 1 ? 103 was observed with mungbean-garri sample packaged in sac bag and stored on the shelf (SBS) during the first and second week of storage, while samples packaged in a plastic container and stored in the cupboard (PCC) recorded the lowest microbial growth count during the third (3 ? 103) and fourth (5 ? 103) weeks of storage. However, microbial growth count recorded in the samples stored on the shelf and inside the cupboard ranged from 103 to 9 ? 103 and were within the acceptable limits for ready-to-eat-foods after four weeks. Conclusively, substituted mungbean-garri diet with the substitution of 30% mungbean and 70% garri was more acceptable and nutritionally better for a feeding trial involving school children. Substituting garri with 30% mungbean is therefore recommended for general use as a way of improving nutrient intake of garri users. Substituted, Mungbean-garri, Proximate, Anti-nutrient, Microbial, Sensory analysis. Cassava is a major staple food in the developing world, providing a basic diet for over half a billion people  and the third-largest source of carbohydrates in the tropics, after rice and maize . Cassava has gained popularity as one of the most important root crops in Nigeria especially in the southern states providing 70- 85% of the total energy for the people . Like other roots and tuber crops, cassava contain anti-nutritional factors and toxins . Cassava can be processed in many ways; boiling, slicing and fermenting to reduce the anti-nutritional factors. It can also be processed into flour for bakery . However, cassava roots are very rich in starch containing small amounts of calcium (16 mg/100 g), phosphorus (27 mg/100 g), vitamin C (20.6 mg/100 g), poor in protein and other nutrients . On the other hand, legumes are least expensive source of plant protein and are two to three times richer in protein than cereals and tubers . They are rich in B vitamins (thiamine, riboflavin, and niacin) which help to release energy from nutrients, they	contain fiber and low glycemic index . The Swedish dietary guide line , recommends an intake of half a deciliter cooked legumes per day for healthy living. Mungbean (Vigna radiata) as a food legume has been transformed from marginal to relatively important crop in Asia, due to its numerous contributions in improving rural household income, expanding employment opportunities, diversifying diets, increasing nutritional security, and enhancing soil fertility . The review of the nutritional value of mungbaen has highlighted the potential of mungbean in tackling malnutrition . Protein content of mungbean flour has been reported to range from 24.9-25.1% [12,13]. As a legume, mungbean contain anti-nutritional components. Philip and Prema , recorded a range in trypsin inhibitor activity from 56-98 TIU (trypsin inhibitor units)/mg and tannin content to range from 3.1 to 4 g/kg-1 of grain in five popular mungbean varieties cultivated in India. Nevertheless, nutrient composition of cassava products can be improved through food-to-food fortification, enrichment or supplementation. Supplement is an addition to something to increase its size or make up for a deficiency . A Study conducted by Manary , showed that in food supplementation phyto-nutrients occurring together in nature act together in some ways to protect each other and to actually make the other stronger. Fortification and supplementation should be seen as complementary to food-based strategies and not as a replacement . Widely consumed cassava-based traditional diets when adequate and varied are likely to be generally healthful and more protective against chronic non-communicable disease than the typical western diet consumed predominantly in industrialized societies . As a matter of fact, enhancing the protein content of cassava products to 55% will go a long way in reducing the incidence of protein-energy malnutrition in Nigeria, especially in children . Fermentation is one of the oldest and cheapest traditional processing methods used in the home and industries to improve the nutritional quality of food and reduce anti nutrient and toxic substances (like phytic acid, polyphenols and oxalic acids, HCN etc.) to improve food use . Fermentation extends shelf life and level of safety of food products . It increases essential amino acids like methionine, improve palatability, increases non-protein nitrogen . It enhances flavor, texture, keeping quality and improves nutritive values . Fermented corn, cowpea, bambaranuts and African yam bean are known to have higher nitrogen balance than its unfermented counterparts . Fermentation has been found to reduce the phytic acid (30-38%) as well as trypsin inhibitor activity (19-63%) in mungbean . According to Dhrandhar and Chang , soaking navy and red kidney beans for 16 hours in water showed significant decrease in trypsin inhibitor activity. The present research is designed to improve the nutritional quality of garri a commonly consumed cassava-based diet in south eastern Nigeria through food-to-food supplementation. Mungbean (Vigna radiata) seed was purchased from farmers in Lagos State (western region), while garri was purchased from Eke Umuagwo-Ohaji, Owerri Imo State in the south east region, all in Nigeria. Production of fermented mungbean sample: Sorted mungbean seeds was washed and soaked in a plastic container. After 16 hours fermented mungbean sample was thoroughly washed and boiled for 20 minutes. The boiled mungbean sample was drained in a metal sieve. The sample was later spread on oven trays and dried (at 60°C) for 6 hours. Dried mungbean sample was cooled in room temperature for 24 hours on black polyethylene material before packaging in a rice sack (Figure 1). Production of mungbean-garri diet: The fermented mungbean sample substituted ‘garri’ (a cassava product widely consumed in the south eastern Nigeria) in the ratios of: 30 (M): 70 (G); 40(M): 60 (G); 50(M): 50(G) and 60 (M): 40(G) (Table 1). The different recipes were mixed homogeneously and milled with a local milling machine (Figure 2). The samples including 100% garri were properly labeled (A-E) and stored for nutrient determination and sensory evaluation. Figure 2. 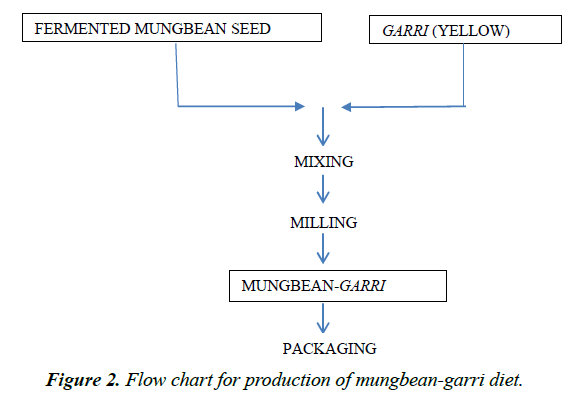 Flow chart for production of mungbean-garri diet. Table 1: Recipe for mungbean-garri diet. Substituted mungbean-garri diets were subjected to chemical analysis to determine the proximate (protein, moisture, crude protein, crude fiber, fat) and anti-nutritional (saponin, tannin, phytate, oxalate and alkaloids) compositions following the different standard methods . Carbohydrate content of the diets were determined by difference. The mungbean-garri samples and the 100% garri were later reconstituted with boiling water following the standard method of preparing ‘eba’ (ready-to-eat garri diet) for sensory evaluation. The sensory evaluation was conducted with 30 untrained taste panel (school children), using a nine-point hedonic rating scale . The children were properly guided to present true individual perception about the diets. Most acceptable substituted mungbean-garri diet 30%(M): 70%(G) was later subjected to storage in different packaging materials (polythene bag, sack bag and plastic container) to determine microbial growth count at weekly intervals for a period of four weeks. Microbial growth count was determined following the standard method . Data generated from chemical and sensory analysis were subjected to analysis of variance (ANOVA) using statistical package for social sciences (SPSS version, 20.0). Mean of triplicate data generated from microbial growth count was calculated on excel spread sheet and presented in tabular form. The proximate composition of substituted mungbean-garri diets ranged from: crude protein (2.16-4.42 g/100 g), crude fiber (1.68 g-2.04 g/100 g), ash (0.7-2.84 g/100 g), crude fat (2.13- 2.45 g/100 g) (Table 2). The carbohydrate content of all the garri samples (82.09 g-88.4 g/100 g) met ≥65 g/100 g carbohydrate content recommended by WHO  in the complementary food. However, the energy content of substituted mungbeangarri diets (375 kcal-377 kcal/100 g) are almost within the 376- 480 kcal/100 g recommended for infants and young children . Table 2: Proximate composition of mungbean-garri diets. The anti-nutrient composition of the substituted mungbeangarri diets are in the following range; saponin (1.47-2.87%), tannin (0.96-1.08%), phytate (0.19-0.27%), oxalate (0.43- 0.71%) and alkaloids (1.82% 4.15%). Some of the antinutrients (saponin, phytate and oxalate) evaluated were found to be significantly lower (p<0.05 level) in sample A (Table 3). However, the low level of anti-nutrients observed with the mungbeab-garri diets could be attributed to the processing methods (fermentation and boiling) applied. Many traditional preparation methods (e.g., fermentation) reduce anti-nutrients, such as phytic acid, increase the nutritional quality of plant foods, and are widely used in societies where cereals and legumes are a significant part of the diet [31,32]. Generally, cassava based food products are fermented to reduce levels of both toxins and anti-nutrients. The range of anti-nutrient compositions observed with substituted mungbean-garri diets were slightly higher than what was reported by Agugo et al. , in a weaning food (mungbean-maize gruel) for saponin (0.72-1.16%), tannin (0.49-0.84%), and alkaloids (0.62-1.4%) but slightly lower in phytate (0.59-1.20%). According to Agugo and Onimawo , moist and dry heat treatments reduced the saponin, tannin, oxalate, phytate and alkaloid, contents of raw mungbean seeds to very low acceptable level. Legumes contain phytate and other components which reduce bioavailability of minerals and other nutrients, but boiling, soaking, frying, roasting, germinating, fermentation and autoclaving reduces the harmful components in legumes to insignificant and harmless concentrates . It has been reported that fermentation can be used to reduce the phytic acid content of complementary foods . In another research, Khalil , found that fermentation helped to reduce the phytic acid (30-38%) as well as trypsin inhibitor activity (19-63%) in mungbean. It equally increases essential amino acids like methionine, improve palatability, increases non-protein nitrogen . It enhances flavor, texture, keeping quality and improves nutritive values . According to Dhrandhar , soaking navy and red kidney beans for 16 hours in water showed significant decrease in trypsin inhibitor activity. However, some anti-nutrients may exert beneficial health effects at low concentrations. When used at low levels, phytate, lectins, tannins, amylase inhibitors and saponins have been shown to reduce the blood glucose and insulin responses to starchy foods and/or the plasma cholesterol and triglycerides . Table 3: Anti nutrient composition of mungbean-garri diet. Table 4 shows the mouldability scores of quadruplet recipes of substituted mungbean-garri diets. Sample A (30 M: 70 G) ranked highest in all the parameters on a 9-point hedonic scale, even higher than control E (100% garri sample), though not significant (p<0.05) in the texture, aroma and general acceptability. Significant difference (p<0.05) was observed in appearance of samples A (30 M: 70 G), C (50%M:50%G) and D(60%M:40%G). The high sensory scores obtained with sample A in all the attributes could be due to the low proportion of mungbean (30%). It has been reported that consumers' previous experience with similar products might affect their preference for certain textural attributes . Sample A (30 M:70 G) was most acceptable to the panels though it has the least protein content. According to Akubor and Ojih,  organoleptic tests in all foods are generally the final guide of the quality from the consumer’s point of view. Microbial growth count in the most acceptable mungbean-garri diet after 4 weeks of storage reveals that mungbean-garri samples contain fungi counts that range from 1 × 103-9 × 103 cfu/g (Table 5). This finding corresponds with the range of microbial growth count (1.8 × 102-4.8 × 105 cfu/g) on bread produced from complementary flour of wheat and peanut after 10 days of storage . But does not correspond with Ariahu, et al. , where stored food formulations from germinated grains remained stable for up to six months of storage and at a lower microbial growth count that ranged from 10-102 cfu/g. It was observed that the microbial load of the mungbean-garri increases as the time extends but was still within the safe limit after 4 weeks . Higher microbial growth count was observed with sample stored in polythene bag and kept in the cupboard in all the weeks. It has been reported that shelf life of food products depends on a number of factors such as processing method, packaging materials and storage conditions. 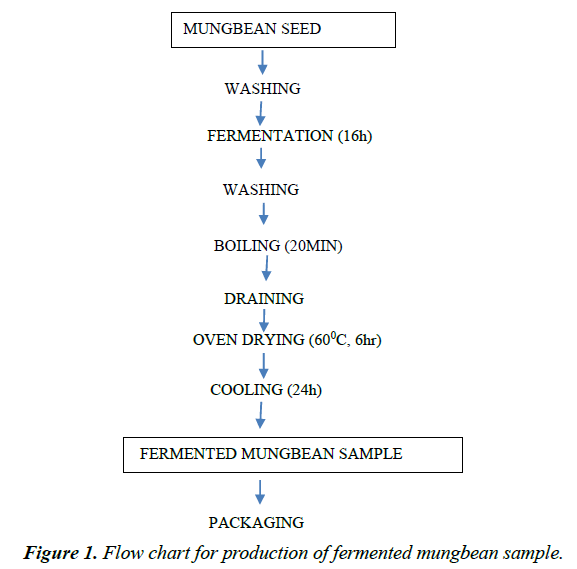 The fermentation (16 hours) process applied in the production of mungbean-garri sample may have contributed to the low microbial growth count observed. Fermented corn, cowpea, bambaranuts and African yam bean are known to have higher nitrogen balance than its unfermented counterparts . Again, fermentation has been found to extends shelf life and level of safety of food products . In many cases shelf life is taken as the time within which a product remains stable . The microbial growth counts observed in mungbean-garri sample after a period of 4 weeks were found to be within acceptable limits for ready-to-eat foods (International Commission on Microbial Specifications for Foods, 1996). Table 4: Mean scores of the acceptability test mungbean-garri diet. Table 5: Total viable counts of microbial loads in mungbean-garri diet. Substituted mungbean-garri diet in the proportion of 30% mungbean and 70% garri was more acceptable to the taste panels (school children) and nutritionally better for feeding school children. Lower microbial growth count was observed with mungbean-garri (30% M:70% G) sample packaged in sac bag and plastic container after four weeks of storage. Substituting garri with 30% mungbean is recommended for children and for all people as a way of improving nutrient intake of garri users. Substituted mungbean-garri diet packaged in sack bag or plastic container can be stored in the cupboard or on shelf for up to four weeks. Fauquet Cl, Fargette D. African Cassava Mosaic Virus: Etiology, Epidemiology, and Control. Plant Disease. 1990;74:404-11. Nwokoma SN. Nigeria’s staple foods. Springfield publishers Ltd;2003. Aneidu C, Agugo UA. Sensory Evaluation of cassava- based products Complemented with mungbean flour and paste. Nigerian J Nutr Sci. 2008;29:276-84. Opie FD. Hog and Hominy: Soul Food from Africa to America. Columbia University Press;2008. Onuh MO, Ijezie AC. Effects of tillage practices on the incidence and severity of Cercospora leaf spots diseaase in Vigna radiata (Mungbean) cultivated in owerri, Imo State. Int Sci Res J. 2010;41-60. Becker B. The contribution of wild plants to human nutrition in the Ferlo (North Senegal). Agro-forestry Syst. 1983;2:256-67. Shanmugasundaram S, Keatinge JDH, Hughes JD. The mungbean trasformation: adaiversifying crops, defeating malnutrition. Int Food Policy Res Inst. 2009;922:103-8. Ramakrishan MN, Yang RY, Warwick JE, et al. Biofortification of mungbean (Vigna radiata) as a whole food to enhance health. J Sci Food Agric. 2013;93:1805-13. Deudie T, Hardy J. Physico-chemical and functional properties of flours prepared from common beans and green mungbeans. J Agric Food Chem. 1996;44:3029-32 . Agugo UA and Onimawo AI. Effect of heat treatment on the Nutritional Value of mungbean. Nigerian J Nutr Sci. 2009;30:10-5. Philip J, Prema L. Variability in the antinutritional constitutes in green gram Vigna radiata. Plant Food Hum Nutr. 1998;53: 99-102. Manary MJ. Local production and provision of ready-to-use therapeutic food (RUTF) spread for the treatment of severe childhood malnutrition. Food Nutr Bull. 2006;27:83-9.
WHO. Requirements of Vitamin A, Iron, Folate and Vitamin B12. Report of a jiont FAO/WHO Expert Consultation. FAO, Rome; 1998. World World Organization. Diet, nutrition, and the prevention of chronic diseases Report of a WHO Study Group (WHO Technical Report Series 797); 1990. Gibson HC. Traditional food-processing and preparation practices to enhance the bioavailability of micronutrients in plants-based diets. J Nutr. 2007;137:97-100. Hesseltine CW, Wang LH. The importance of traditional fermented foods. Biol Sci. 1980; 30:402. Reddy NR, Salunkhe DK. Effect of fermentation on phytate, phosphorus and mineral content in gram rice, and black gram rice blends. J Food Sci. 1980;43:1703-13. Eka OU. Effect of fermentation on the nutrient value of locust bean. Food Chem. 1980; 5:303-13. Nnam NM. Nitrogen and mineral utilization of young children fed blends of fermented or unfermented corn (Zea mays L.) African yam bean (Sphenostylis stenocarpa) and cowpea (Vigna unguiculata). Ecol Food Nutr. 1999; 38:21-34. Khalil AA. Nutritional improvement of an Egyptian breed of mungbean by probiotic lactobacilli. Afr J Biotechnol. 2006;5: 2006-212. Dhrandhar NV, Chang KC. Effect of cooking on firmness, trypsininhibitors, lectin and cysteine content of navy and red kiddey beans (Phaseolusvulgans). J Food Sci Inst Food Technol. 1990;55:470-4. Association of Official Analytical Chemists. Official Method of Analysis of the AOAC W. Horwitz Editor Eighteen Edition. AOAC, Washington DC; 2006. Ihekoronye A, Ngoddy PO. Intergrated Food Science and Technology for the tropics, London.1985:60-134. Fawole MO, Oso BA. Laboratory Manual of Microbiology. Spectrum books Ltd, Ibadan; 1998.
WHO. Global strategy on diet, physical activity and health. 2004. Cameron M, Hofrande Y. Manual on feeding infants and young children. 3rd ed. Oxford University Press, New York, United States of America; 1983. Reddy NR, Pierson MD. Reduction in anti-nutritional and toxic components in plant foods (A) by fermentation. Food Res Int. 1994;27:281-90. Agugo UA, Okere TO, Anya KM. Investigating the nutrient composition and anti-nutritional factors of ‘Akidi’ (Vigna unguiculata unguiculata). J Environ Scie Toxicol Food Technol. 2013;5:55-8. Agugo UA, Nwogwugu M, SundayS, et al. Chemical and microbial qualities of weaning food produced from mungbean (Vigna radiata) and maize (Zea mays). Central Eur J Experimental Biol. 2013;2;34-9. Sathe SK. The nutritional value of selected Asiatic Pulses: chickpea, black gram, mungbean and pigeon pea. Legumes and oilseeds in nutrition Nwokolo E and Smartt J. Published by chapman and Hall. 1996:13-31. Perlas LA, Gibson RS. Use of soaking to enhance the bioavailability of iron and zinc from rice-based complementary foods used in the Philippines. J Sci Food Agri. 2002;82:1115-21. Habtamu FG, and Negussie R. Anti-nutritional Factors in Plant Foods: Potential Health Benefits and Adverse Effects. Int J Nut Food Sci. 2014;3:284-9. Hong JH, Park HS, Chung SJ, et al. Effect of Familiarity on a Cross-Cultural Acceptance of a Sweet Ethnic Food: A Case Study with Korean Traditional Cookie (Yackwa). J Sens Stud. 2014;29:110-25. Akubor PI, Ojih SA. Effect of soybean addition on the chemical composition and sensory properties of Apula: A traditional maize based porridge. Nigerian J Nutr Sci. 2011;32:46-50. Yusufu PA, Opega JL, Aka OM. Effect of partial replacement of wheat with peanut flour on the chemical, sensory and microbial quality of bread. Nigerian J Nutr Sci. 2016;37:72-7. Ariahu CC, Ukpabi U, Mbajunw KO. Production of African breadfruit (Treculia africana) and soy bean (Glycine max) seed based food formulations.in: effect of germination and fermentation on nutritional and organoleptic quality. Pl Foods Hum Nutr. 1999;54:123-266. ICMSF. Microorganisms in Foods 5-Microbiological specifications of food pathogens. Blackie Academic & Professional, London; 1996. Poter NN, Hotchkish JH. Food Science (5thedn), BBS Publishers and Distribution, Daryaganji, India; 1997.